Through no fault of his own, Edvard Munch could be considered an agent of kitsch. He feared this would be the case, writing in his undated diaries that "kitsch" was something "I have worked against all my life." But after his death, re-creations and imitations of his paintings and prints—mostly of the "Scream"—weakened his paradoxical purpose: to simultaneously provide the viewer with an escape from and confrontation of anxiety. Although the "Scream" has been battered by commercialism, Munch's angst pulsates in each of the 21 pieces held in the National Gallery's latest exhibit on the prolific printmaker. "Edvard Munch: Color in Context," like most exhibits when it comes down to it, has a superfluous theme to entice patrons and indulge the interests of its curators. The National Gallery's Jonathan Bober, senior curator of prints and drawings, and curatorial assistant Mollie Berger had an idea to relate Munch's prints to theosophy, a fashionable school of thought during the turn of the century that attempted to blend mysticism and science. Their assumption is that Munch would have applied theosophical color theory to his work. It is not a bad assumption: Munch believed he could see auras vibrating from colors, a popular concept shared by theosophists. "Color in Context" cites the theosophical text Thought Forms, published in 1901, which described colors by associated emotions in a color association chart, which is also handily provided at the entrance of the exhibit. Although the color chart seemed silly, I figured if it served any purpose I would find out more about Munch's personality and intention. What I first noticed: Munch must have had a really hard time with women. You don't even have to look at the color chart to see that. "Girl with the Heart" shows a woman eating a heart. "The Vampire" shows a woman sinking her teeth into a man's throat. 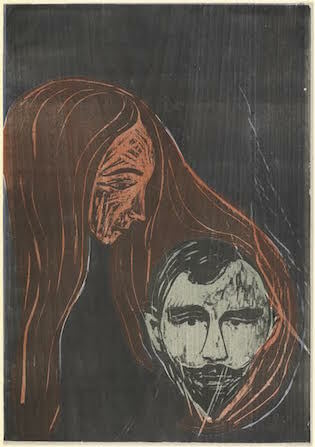 "Man's Head in Woman's Hair" shows a distraught, male face wrapped—or is it strangled?—in hair extending from a floating female head. According to the chart, the brownish tint in which he renders women is meant to denote "selfishness." My favorite print in the exhibit depicts a hauntingly beautiful woman with striking green eyes; her image is endearingly titled "The Sin." Apparently, those green eyes signify "the wish to be all things to all men." His struggle with established religion is also reflected in his subject matter and color choice. 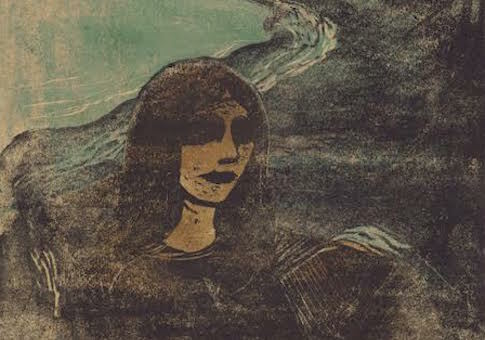 Hollow eyes, a prominent feature of the subject in "Girl's Head Against the Shore" or the fetus in "Madonna," could be interpreted as a sign of introspection. "Old Man Praying" shows what the title suggests, but the yellow tones Munch applies to the print, according to theosophists, implies "highest intellect, thoughtfulness, and contemplation." Viewers can see that to Munch, spirituality is the discipline of looking inward. These associations can indeed provide an interesting context for some of the prints, but as the curators note, Thought Forms was published after much of the pieces in the exhibit were created. Color associations are simply a way of seeing the psychology behind his work. Munch's disturbing qualities have successfully transcended his time: Viewers today will find the prints undeniably creepy. "What one paints must be done with will and feeling," Munch wrote in his diary. "It does not help to create in a way that settles for unfelt and weak-willed things." The genuine attitude of his work reminded me of a letter written by Willa Cather in 1936, in which she said that all of art's purpose is to provide an escape, borne by the originality of its creator. But art, she added, can be marred when it is used for another purpose. "Economics and art are strangers," she wrote. While the dealers of Christie's and Sotheby's could vehemently disagree, the artists themselves would not. When Munch's art became subject to kitsch, its raw emotion was obscured by a commercial veneer. Its intimacy was gone by way of the pocketbook, and although it still served a purpose, the "Scream" being used as a souvenir figurine does not allot for its original creator's intentions. But great art survives any number of figurines and posters. Seeing the images in person showed that the "economics" of the matter only has so much sway over the art itself. Munch's prints are suffused with the agony that birthed them. They still have the power to reveal Munch's inner life as only the arts can.